Every once in a while, a film will choose to take the path less traveled and use unique poster art that eschews Photoshop and goes for aesthetic beauty instead. 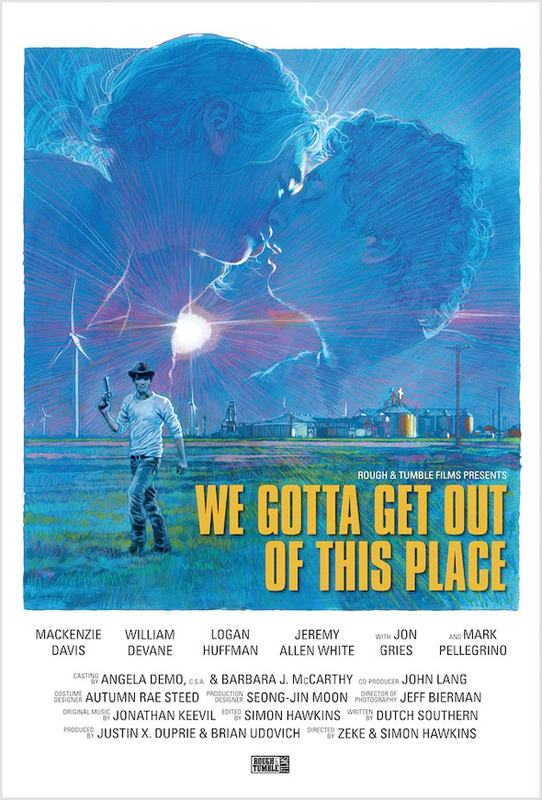 Here we have the TIFF promo poster for Simon Hawkins and Zeke Hawkins' We Gotta Get Out of This Place, a twisted Texas-set crime drama about three teens (Mackenzie Davis, Jeremy Allen White and Logan Huffman) hoping to make a break for it and escape their dead-end existence in their cotton-mill town. The poster features hand-painted artwork by Eisner Award winning artist Sean Phillips that's just gorgeous. This film is now on our festival radar thanks to this art. From TIFF: Tipping its hat from the start to the classic novels of pulp crime master Jim Thompson, We Gotta Get Out of This Place is a tight nouveau noir by first-time feature directors Simon and Zeke Hawkins. The Hawkins brothers have crafted a tense thriller in their story of three teens, on the verge of escaping a dead-end existence in their cotton-mill town, who get sucked into the seedy underbelly of organized crime, Texas style. We Gotta Get Out of This Place is co-directed by Connecticut-born filmmakers Simon Hawkins & Zeke Hawkins, from a screenplay written by Dutch Southern. The film will be premiering at the Toronto International Film Festival this fall, where it's seeking a US distributor. Be on the lookout for early reviews.